@Gidget, no offense here but you seem ( to me ) to confuse RL and IG.. maybe there is something to dig for you about this. They are staying polite, and talking fairly on the subject.. unlike you. 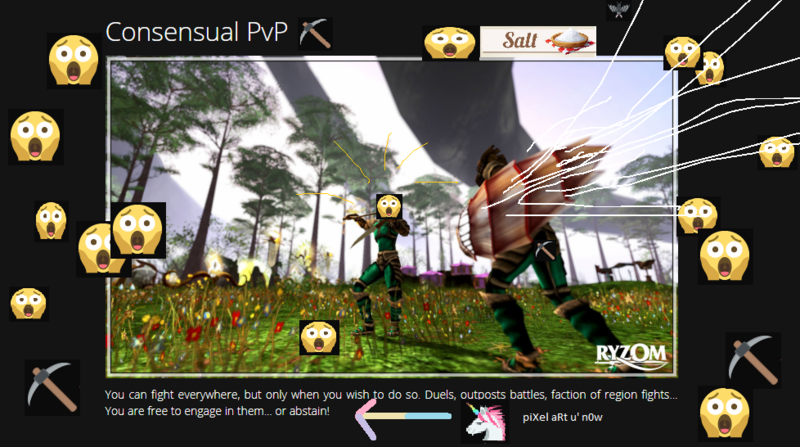 I do read a lot about your opinion a bit everywhere on the forum, and ( sadly ) it is most of the time overly rude when it come on the PvP subject. Or anything related to it, like Roleplaying. So take Ryzom.com, the game you love so much. You can fight everywhere, but only when you wish to do so. Duels, outposts battles, faction or region fights... You are free to engage in them... or abstain! If you dont like to be engaged freely in a player versus player game, you abstain to come in the area engaging player versus player.. simply. There is no need to complain about anything here, yeah.. really.. crazy right? When you enter a PvP zone, whatever faction you are; or race; or religion; or clan; or guild; or gender IG, you are warned that you are now attackable by everyone that wish to do so. And yes, even if you are a digger. Digger do deplete important and precious ressource, that will be used to craft efficient weapons or armors. And fighter do not fight naked. Now do the math, and understand why a digger is kill on sight. ( if its not to hard for you ofc, otherwise i forgive you personaly, no biggy ). But i did notice one point in all your non sense, misbelieves and RL/IG confusion you like to spread ( or seem to ). Its that yes, now the game need to deal with a mixed culture and community. But its been years now, guess its time to adapt. No need ticket or complain about PvP in a PvP zone, no need to be a genius to understand that.